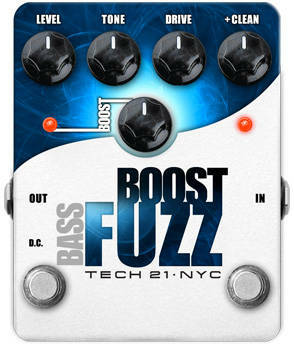 When you need a huge, 360-degree, room-filling bass tone, step up to the Bass Boost Fuzz. From the fat, gritty sounds of the 60's fuzz bass to the subterranean growl of industrial metal, the Bass Boost Fuzz puts musical rage in your low-end. When you need more focus and edge, dial in the +CLEAN control to add just the right amount of direct tone to your mix. I was a long time user of the bass big muff. But I found the sound too compressed and it didn't supply the bottom end that I wanted. Switched to this after youtubing for quite a while. Boy does this thing open up!. The clean blend knob allows you to dial in bottom end. This pedal is not mild. The fuzz is heavy and sounds amazing. Glad I went with this over the wooly mammoth, and at half the price!